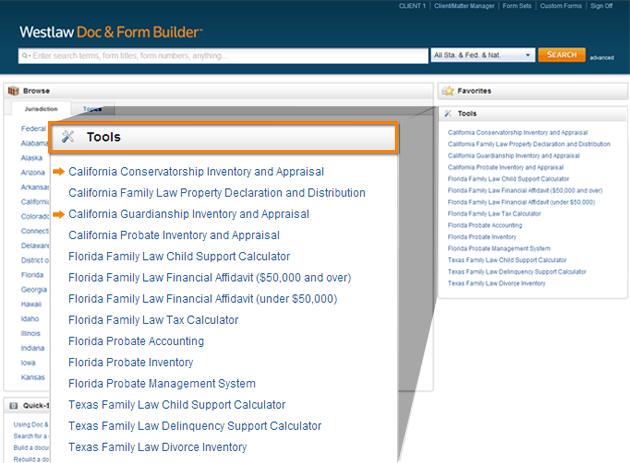 California Form Builder now features Guardianship and Conservatorship Inventory & Appraisal Calculators that allow for easy entry of all property of a minor or conservatee that is to be administered and any appraisals of such property by the probate referee. The California Guardianship and Conservatorship Inventory and Appraisal Tools simplify the entry of transactions, dramatically reducing the time necessary to handle Guardianship and Conservatorship matters. Separate calculators are available for Guardianship matters and Conservatorship matters. 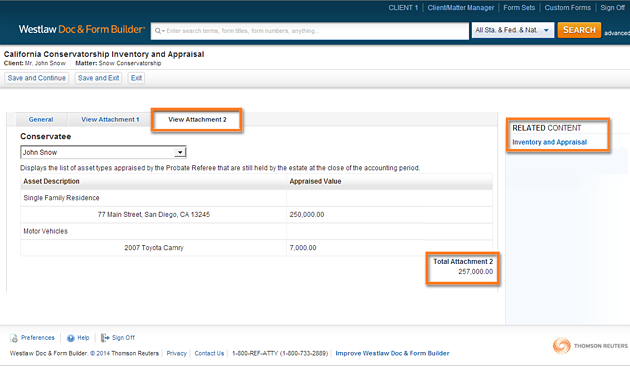 Both eliminate the need to manually calculate inventory totals, and they can be found under the Tools box on the Form Builder homepage. For California practitioners, these calculators are another way Form Builder helps streamline document assembly. Before you can begin entering inventory items, you must either select a current Client and Matter or you may use the green plus signs (+) to create a new Client and Matter. 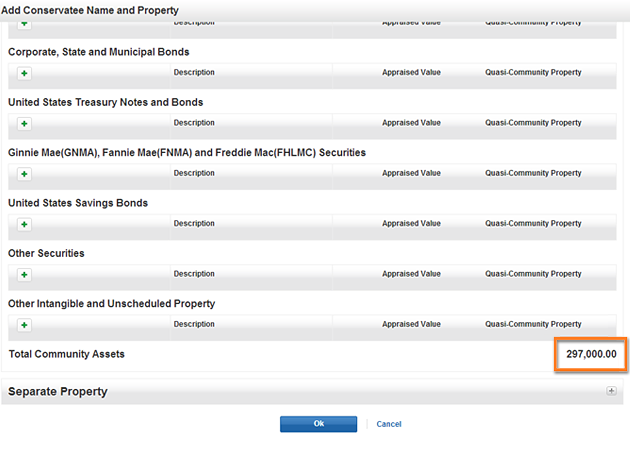 Notice the three tabs across the top of your screen: General tab (to enter the name of the Conservatee and any accompanying assets), View Attachment 1 tab (displays the list of asset types appraised by the Conservator that are still held by the estate at the close of the accounting period), and View Attachment 2 tab (displays the list of asset types appraised by the Probate Referee that are still held by the estate at the close of the accounting period). Note: The Conservatorship Inventory and Appraisal calculator and the Guardianship Inventory and Appraisal calculator workflow and available features are structured the same. Begin entering data under the General tab by clicking the green plus (+) sign on the left side and enter the Conservatee Name and Alias. You will see that Community and Separate Property are broken into two separate sections. 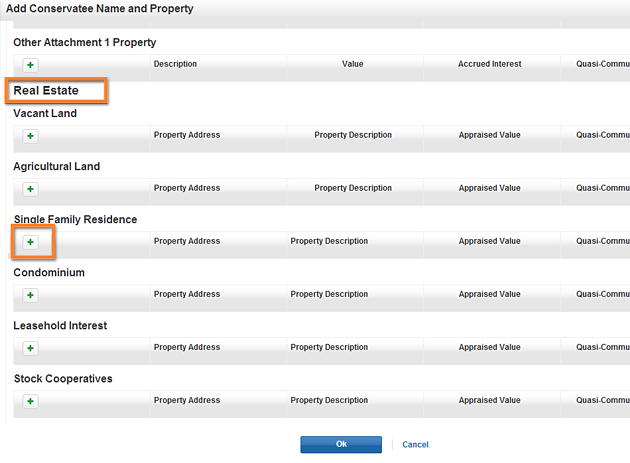 Then, click the gray plus sign (+) to the right to expand the Community Property section. Begin by entering any Cash or Quasi-Community Cash and click the green plus (+) sign to add the appropriate community asset. For example, to enter bank account information, simply click the green plus sign (+) and complete the Description, Balance, and any Accrued Interest. 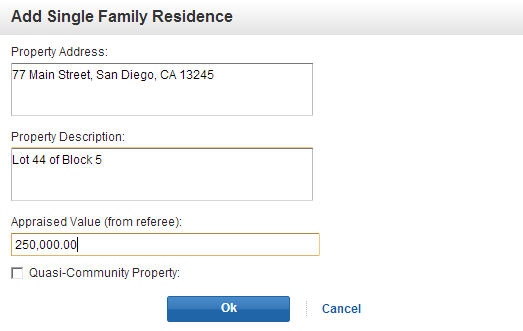 Make sure to check the box below if this is Quasi-Community Property, then click OK once you are finished. You'll see your entry populate under that subsection. 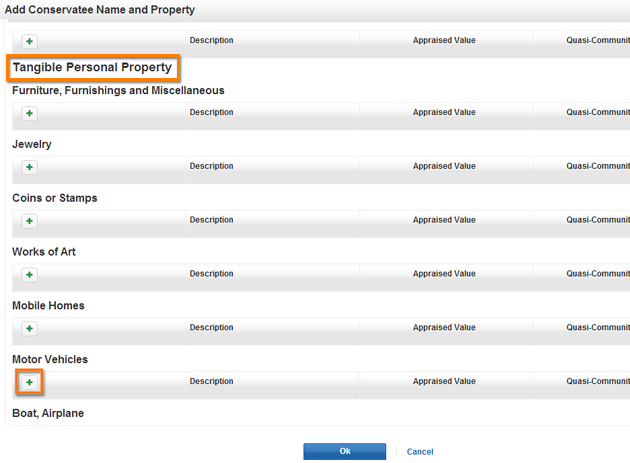 To continue making entries, scroll through the various types of properties. Note: To edit an existing entry, simply click on the entry from the list. If you'd like to delete an entry, click on the X. To enter a Single Family Residence, scroll down under the Real Estate section, click the green plus sign (+) and enter the property address, property description, and appraised value. Make sure to check the box if it is Quasi-Community Property. Click OK once you have completed the entry. To enter any Tangible Personal Property, such as a motor vehicle, navigate to that section and click the green plus sign (+) under Motor Vehicles. Enter a description and the appraised value in the pop-up box, and then click OK. The calculator will total all Community Assets at the bottom. 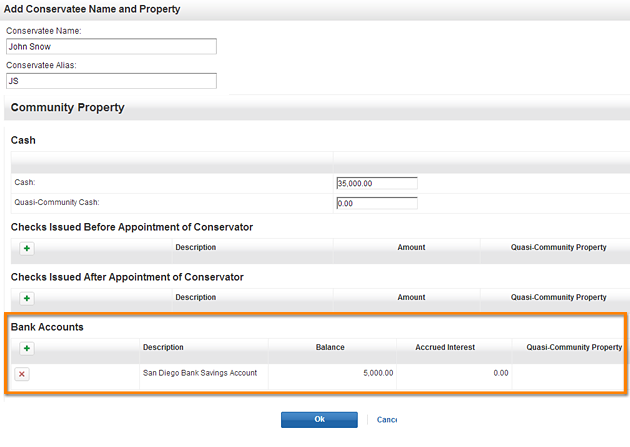 Next navigate to the Separate Property section and click the gray plus sign (+) to expand. Enter any separate property for the Conservatorship. 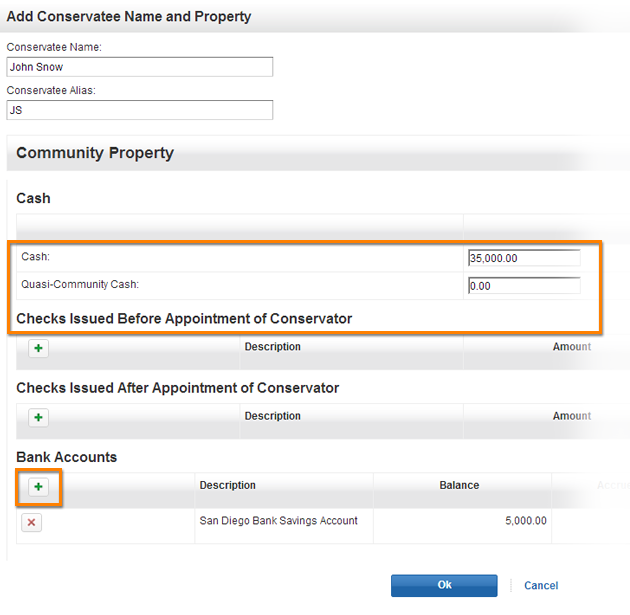 For example, if you need to enter any checks received after the appointment of the conservator, click the green plus sign, (+) enter a description and the amount of the check, and click OK.
All Separate Assets will be totaled at the bottom of the window. 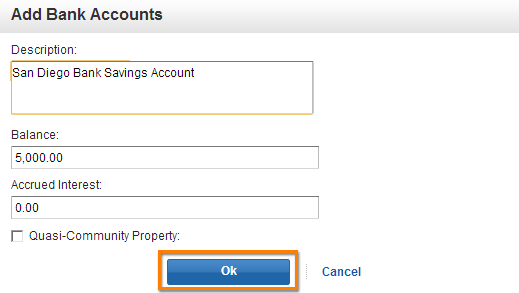 Once you've entered all community and separate property, click OK. When you are finished entering the information, click the Save and Continue button to save your entries and continue working or click the Save and Exit button to save your entries and leave the Inventory & Appraisal calculator. Click Exit to leave the calculator without saving. 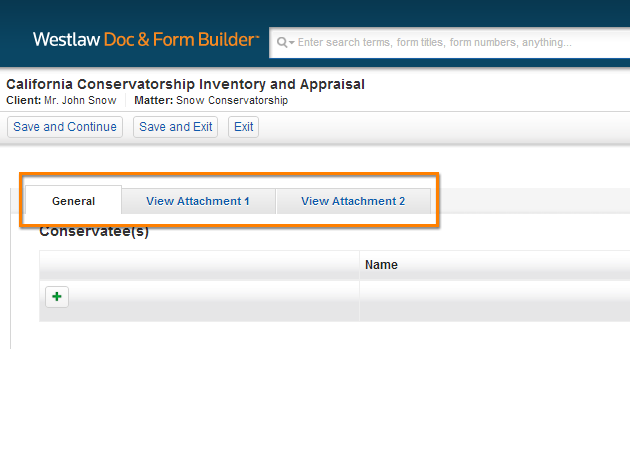 Navigate to the View Attachment 1 tab to see a list of asset types appraised by the Conservator for a specific Conservatee that are still held by the estate at the close of the accounting period. 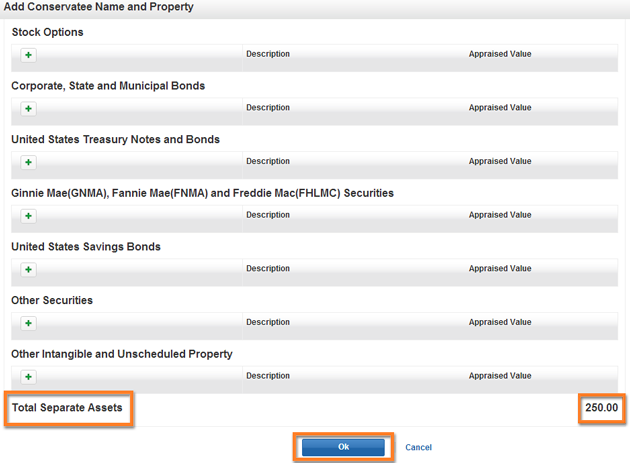 The tab displays asset descriptions, appraised values, and the total value of the assets. This tab automatically updates with information you enter onto the General tab. Note: You cannot edit any entries from here. 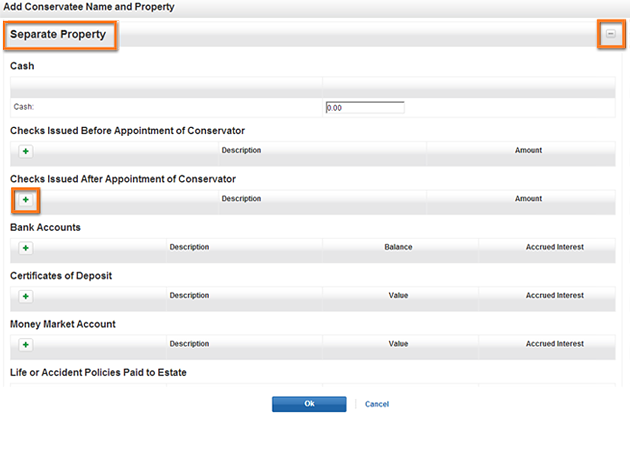 Next, click the View Attachment 2 tab to view asset descriptions, appraised values, and total asset values appraised by the Probate Referee that are still held by the estate at the close of the accounting period. This tab also automatically updates as you make property entries on the General tab. 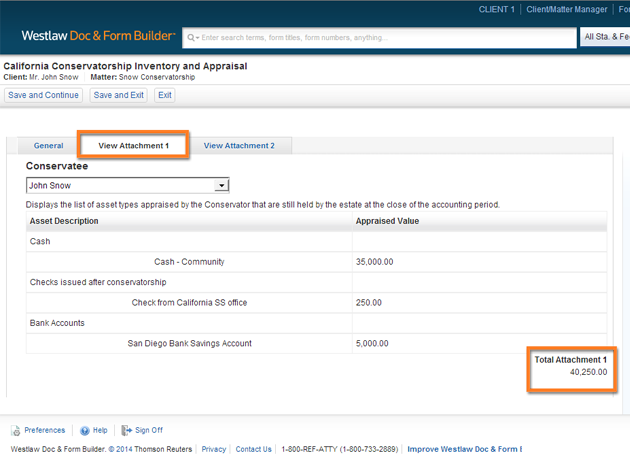 All data that has been entered will be saved under the selected Client and Matter and will auto-populate onto Judicial Council Form GC-040 or the Inventory and Appraisal form. You can access this form directly from the calculator under the Related Content section on the right side. Note: The Guardianship calculator will work the same way as the Conservatorship calculator, but should be used when completing an inventory and appraisal form for a Guardianship matter.